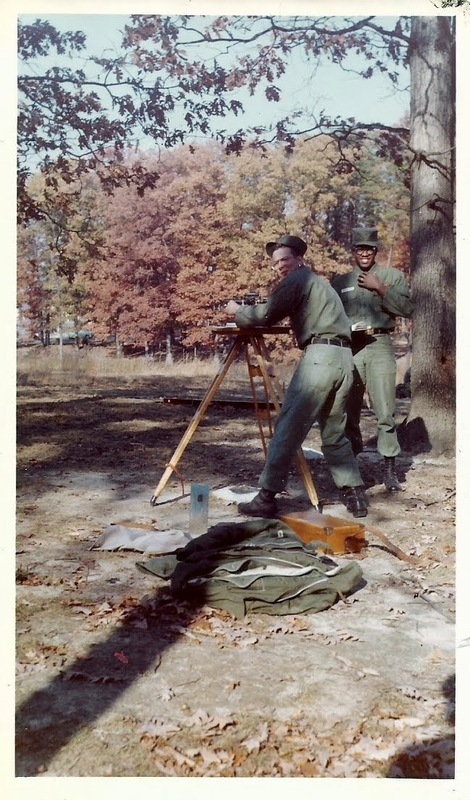 A week ago I picked up some old photographs that are claimed to be of Army surveyors doing some plane table survey work on Fort Belvoir, Virginia. The notations on the back of each photo gives each Soldier’s name and the date – November 1959. While the location is supposed to be Fort Belvoir there’s no written indication that is the actual location. However, having been assigned to Fort Belvoir a number of times I’ll say that the vegetation certainly has that ‘northern Virginia in the fall’ look about it, so I’ll accept the fact that we are looking at a location on or near Fort Belvoir. Another clue is the Soldiers, and more specifically their uniforms. There’s no sleeve rank on any of their field jackets or shirts, indicating to me they are trainees attending advanced individual training at either the Engineer School or the Army Map Service school on Fort Belvoir. 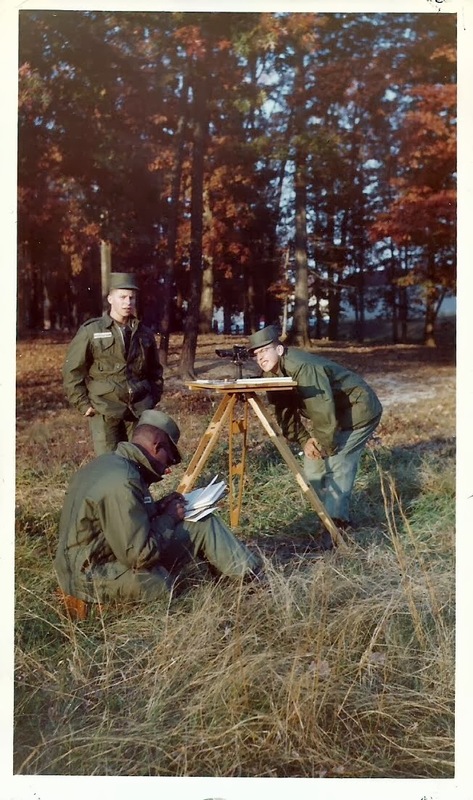 These are most likely young men – probably draftees – who are learning the trade of surveying after graduating from Army basic training. They simply haven’t been in the Army long enough to earn rank beyond that of Private. Plane table surveying was once the primary method of developing detailed sketches and surveys of small areas. The geodetic and topographic surveys would establish he broad framework of survey control and elevation for large areas or regions. The plane table surveyors would follow behind filling in the details – roads, buildings, fence lines, monuments, prominent topology and geology, etc. Plane table work was a close meld of surveying and cartography, and plane table sketches done by talented surveyors are true works of art. 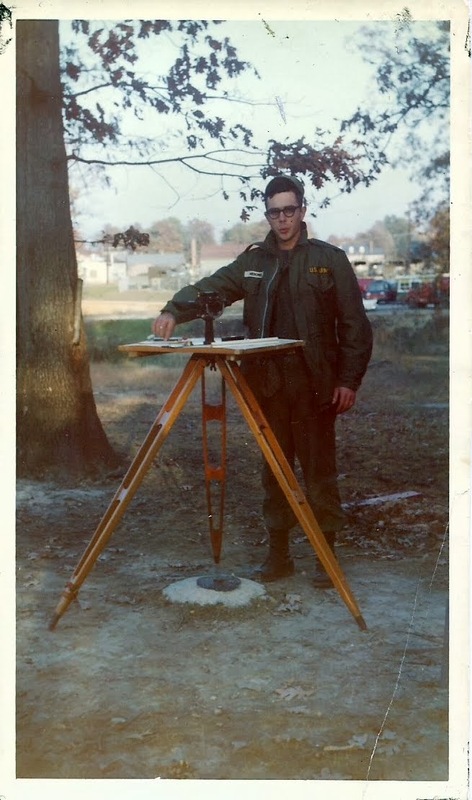 Alas, plane table surveying is also a lost art. It died off back in the 1980s with the introduction of electronic surveying systems – total stations – that can collect data much faster and much more accurately than a surveyor standing at a plane table. While the output of a total station lacks any sense of artistic composition, the data tends to be more accurate and precise. But back to our young men. They had to have scored fairly high on their Army entrance tests to qualify for training as a surveyor, so this was a smart group of guys. Odds are they all had very good math skills. My guess is these young fellows all did their two year military obligations, left the service and went on to enjoy life in the civilian world. A few probably went to college using the generous VA education benefits still in place in the 1950s, a few probably moved on to employment in blue collar jobs. Odds are none of them stuck with surveying in the civilian world – that’s just the way things went. However, I’m hoping that their exposure to surveying and mapping enticed at least one of them to pursue a civil engineering-related field once they left the service. So let’s introduce our hale and hearty young surveyors! These fine fellows are all in their 70s now and hopefully are looking back on long, successful and happy lives. I hope they view their time in the Army with great fondness and the memories of the this beautiful fall day spent in the field learning plane table work brings a smile to their faces. 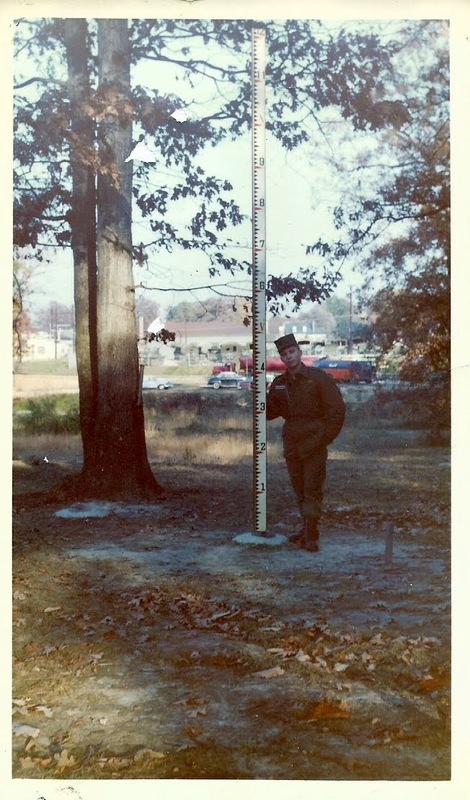 This entry was posted in History, mapping, survey and tagged defense mapping school, dms, fort belvior by Brian Haren. Bookmark the permalink. I went out yesterday, 23 Dec 2013, to check the location i believe where the pictures were taken. the monuments seen in the picture were not there and the trees have changed slightly. In fact, some are not there either. i believe the pictures were taken in the area just west of the JAG building on Fort Belvoir. the street seen in the background is Bixby with DMS headquaters and supply buildings in the background. the parking lot across “Bixby” is the parking lot to the east of Wheeler Hall. there is a ditch with a berm on the far side of the parking lot which i remember having to walk around when going from Wheeler to DMS HQ building. of course, the buildings were not DMS in 1959. that happened 1 July 1972. unless one of the older-timers than me can remember where this surveying was done i will check out when Wheeler Hall & the JAG building were built. when i was out there the scene in the background seemed to fit when i was standing at the edge of the JAG parking lot. A plane table could be used for many things. While in the 30th Engineer Battalion at Fort Belvoir in the 1970's, we were given an original map of the Manassas/Bull Run battle drawn by an Engineer captain. The Carto and Repro folks produced a replica we surveyors could take to the field. The Park Service wanted to know the “exact” location of a stand of trees so that they could insure the trees were not removed by some planned earthwork. Standing on that ground and seeing just how close North and South troops were to each other was an eye opener!! Very nice, thank you. It's nice to learn a little history of the topo world.